This article is brought to you by Canon. As a teacher, chances are, time and money are two of your most valuable commodities. From the moment the bell rings, it’s a rush to squeeze in as much learning time as you can, while constant interruptions can curb the flow of even the most well-planned lessons. Pair that with less-than-ample salaries and a classroom supply list that never ends, and it’s no wonder educators are constantly thinking of ways to cut back. Here at TeacherLists, we went straight to the source and asked real teachers from our Facebook community for their favorite ways to save time and money—and they were happy to deliver. Read on for 25 of their best classroom hacks. 1. Make Velcro your new best friend. 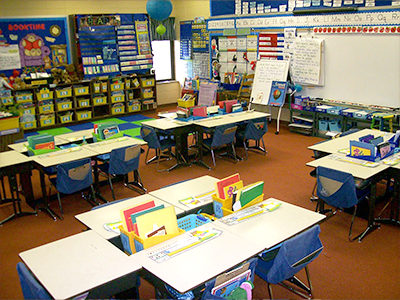 Velcro can be used on virtually everything in the classroom, and though there is a nominal cost, you’ll end up saving money in the long run. 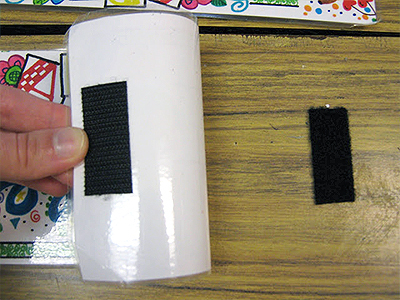 Use Velcro to attach name tags to desks, to hang signs and posters, or to stick dry-erase markers to your whiteboards. And it doesn’t stop there—you can even add it to your door shade for lockdown drills or use the prickly side as a fidget helper for students. (Money-saving tip: buy Velcro strips instead of dots, they’ll last longer and can be cut to whatever size you need!). 2. Two words: Glue sponges. It’s no question that teachers have among the highest vocal demands of any profession. If all that talking, throat-clearing, and whispering haven’t taken their toll yet, you might want to try some of these tricks to keep it that way. Not only will you protect your vocal health; you’ll also save time by not having to constantly repeat yourself. Find a unique-sounding whistle (like a train whistle) to round up your kids at recess or on field trips so kids can quickly distinguish it from other teachers’ attention-getters. Try color-changing lights to signal different classroom actions. Red for silence, green for group talk, blue for whisper talk, and white to line up. Use wireless doorbells to let learners know it’s time to stop working. Many cost as little as $12 and can be personalized to the tone you like best. 4. Want it to last? Laminate it. Lamination may be the single greatest invention ever to cross an educator’s path. Why? Because it allows teachers to preserve the stuff that otherwise would get destroyed in less than a week, saving huge amounts of time and money. One great lamination hack? 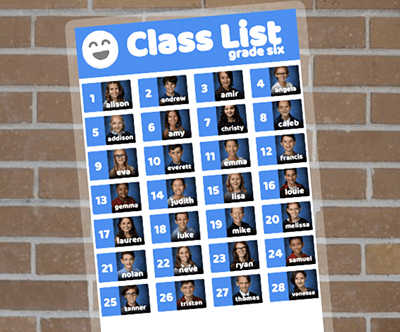 Print out your class list in alphabetical order, laminate it, grab a dry-erase marker, and use it as a reusable checklist for things like class projects, informal assessments, homework, or field trip money. Personal laminators cost around $20; clear sheet protectors are a great alternative if you’re not ready to spring for the full machine. 5. 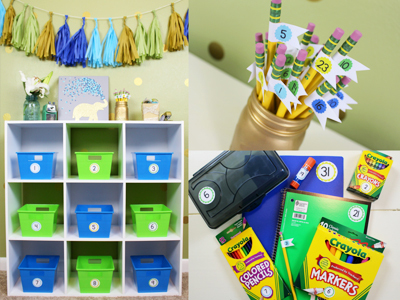 Keep classroom supplies handy. For reading groups and centers, supply tubs are a great way to save time on passing out handouts and manipulatives. Have manipulatives/materials/extra supplies divided up at each table for quick and easy access. 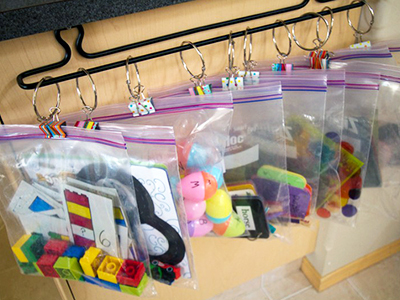 No need to count out manipulatives or search for dry-erase markers. The tubs can also include activities for the group if they finish their work early. 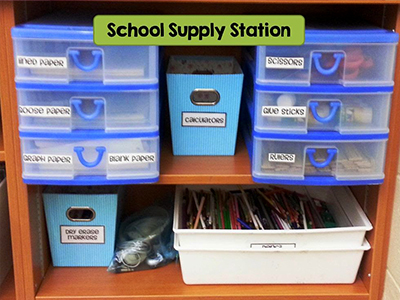 Keep two supply stations, one on each side of your classroom, so kids can grab whatever they need. Assign a “student of the day” to keep the stations supplied. 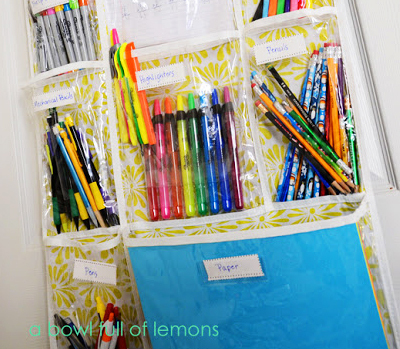 Over-the-door pocket organizers are a great way to do this while saving space. Keep differentiated books at each group/table in your classroom. Early finishers can read at any time without having to search your classroom library. You can keep a mixture of fiction and nonfiction to reach students at different levels. 6. Put ’em to work. Kids are capable of so much more than we give them credit for, and the best part is, most students love to help out. Create a job list and assign different students a new job each week. They can stack chairs, put away iPads, store school supplies, and even wipe down desks. Make this part of their daily routine and you’ll find you’ve gained a few precious minutes of teaching time each day. 7. Print more copies, use less ink. There’s nothing worse than sitting in your classroom at the end of a long day, about to print 25 copies of tomorrow’s quiz, and finding out your printer’s out of ink. 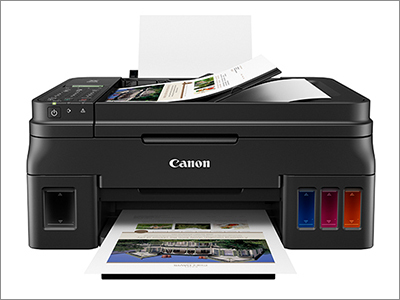 That’s where the Canon PIXMA G4210 Wireless MegaTank All-in-One Printer comes in. This printer is built with a MegaTank Ink system that delivers up to 6,000 black text pages* and 7,000 vivid color pages* before you ever have to refill the ink cartridge. And this baby really does it all–you can scan, copy, or fax multipage documents and even print photos from your iPhone. Total life-changer. 8. If it’s in the classroom, number it. This one is arguably the most helpful teacher hack in the history of teacher hacks. Assign a number to each student to use throughout the entire school year. Then, number everything in the classroom to match. 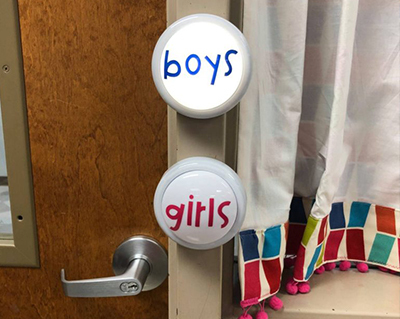 This means cubbies, desks, mailboxes, student supplies—you name it. Got a textbook? Number it. Lining up? Place a number tile on the floor to have kids get in line. You’ll save time in your day-to-day schedule, and it also helps when things get lost—not to mention you won’t have to relabel your classroom from year to year. Major time- and money-saver! 9. Display student work in a snap. 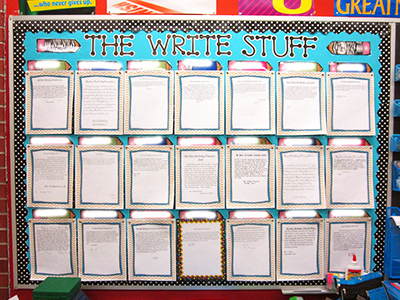 Create an “Excellent Student Work” bulletin board and staple up clear page protectors. You can easily display student work and change it up by sliding the work samples in and out. Kids love seeing their work displayed, and it motivates them to turn in work that is done to the best of their ability in case it’s selected for the board. Each student can choose a piece of work they’re proud of and change it every few weeks with a new assignment they want to show. 10. Say hello to hot glue. Who knew that hot glue was good for so much more than just Pinterest crafts? This strong adhesive is one of the quickest and most cost-effective ways to hang anything and everything in your classroom. Place strips of painter’s tape on your wall first, then use hot glue to hang your posters and peel the tape off when you’re ready for it to come down. Don’t have painter’s tape? You can even glue materials straight to walls, desks or bulletin boards–the dried glue is super easy to peel off, so you’ll never even know it was there. It’s like duct tape, only invisible. Use a program like Google Photos to take pictures of notes and other class “need to know” items. Instantly upload the pics to a public album on your school website so anyone who was absent can see what they missed! So quick and no paper needed. As facilitators of education in this tech-savvy time, it helps to be able to guide your learners from anywhere in the classroom. Luckily, pretty much every piece of technical equipment has gone wireless—keyboards, mice, printers, lights, etc. This mobility means no more fumbling with wires or making students come to you—which means more time for your actual lesson. 13. Make login info easy to find. Make computer login cards for each website your students use and attach them to a book ring for each student. This allows kids find their info independently, and you spend less time logging them in. 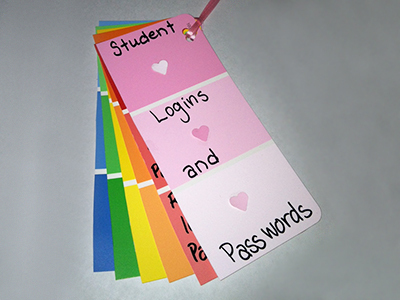 Use paint sample cards and place all technology sign-ins and passwords on them. Use a different color for each website. Give them to students to put into their zippered pouches on their computers, or you can laminate the cards and tape them to the desks. Give each student three sharpened pencils at the start of each week. At the end of the week, those students who still have all three pencils get a small reward. To keep pencils from falling off the top of the desk when the cover is lifted, use a milkshake straw (best size for a pencil to fit in) and cut it into thirds. 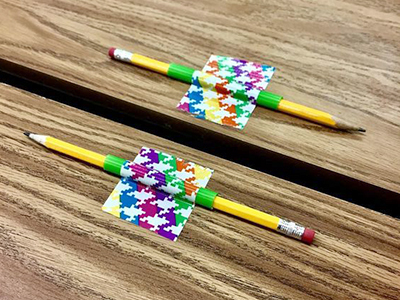 Use one straw piece and some duct tape and tape it to each desk. Now when a student lifts the desk lid, the pencil will stay put. 15. Post a wish list to save time and money. It’s no secret that most teachers spend hundreds of dollars out of their own pockets to keep their classrooms stocked with supplies. But many parents are more than willing to help out; they just need to know what to purchase. 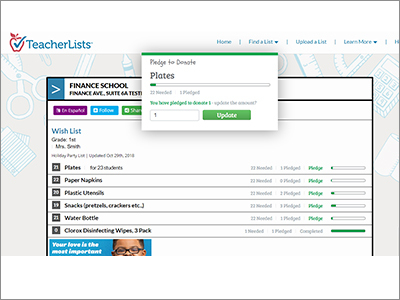 By using a tool like the TeacherLists wish list service, you can update your classroom needs throughout the year so parents know exactly what you need for your classroom. You’ll save not only money but also time when you don’t have to make an extra Target run each month. 16. Make bulletin boards that last a lifetime (almost). 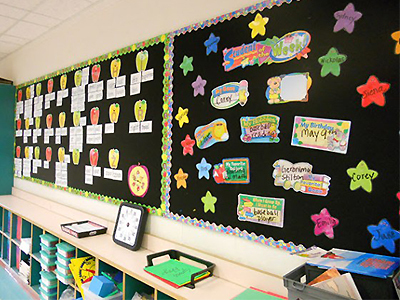 Nothing brightens up a classroom quite like a well-crafted bulletin board, but the time and energy spent creating them can be a headache. Instead of paper, try using fabric, felt, or even cheap tablecloths as bulletin board backgrounds. They’re super fast—simply measure, cut, staple, and done! The fabric won’t fade or rip, and it will last for years. 17. Take the hassle out of photo prints. These days, it’s all about the pictures. We all love to print candid photos of our students for bulletin boards, classroom doors, and class projects, but who has time to make multiple trips to the store for prints? No one. Which is why the Canon IVY Mini Photo Printer needs a place in every classroom. This pocket-size printer may be less than 1 inch tall, but trust us, it packs a big punch. 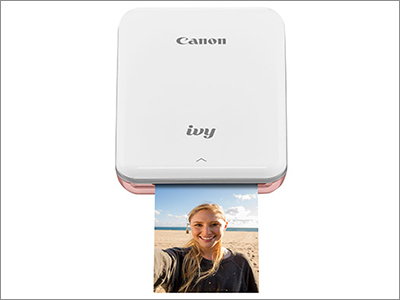 Print 2″x3″ photos in seconds from any compatible phone or tablet. There’s no ink needed, and it runs on a built-in rechargeable battery, so there’s no need for cables except when it’s charging. Just throw it in your purse and print vivid images no matter where you happen to be. 18. Try something totally new. Sometimes, it just takes one new idea from a dedicated teacher to make a positive change for an entire school. 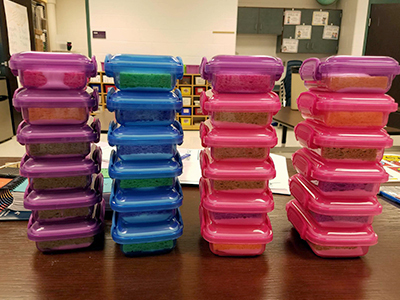 , a teacher from our Facebook community, started a butterfly garden at her school to help her science department save money on butterfly kits. When starting the garden, Maria involved students, parents, and staff. 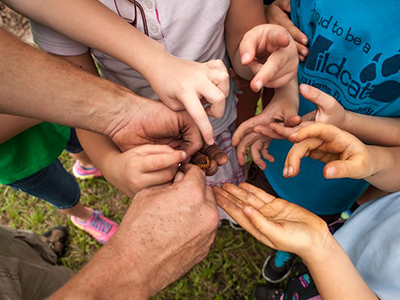 They now have a three-year-mature butterfly garden with an endless supply of caterpillars, chrysalides, butterflies, and eggs to observe and appreciate. 19. Prep your games ahead of time. If you play a lot of educational games in class, reduce setup time by using preassembled Ziploc bags with all of the appropriate game pieces inside so students can get right to it. When it’s time to put things away, have students check the inventory on their bags so they’re all set to use it the next time. 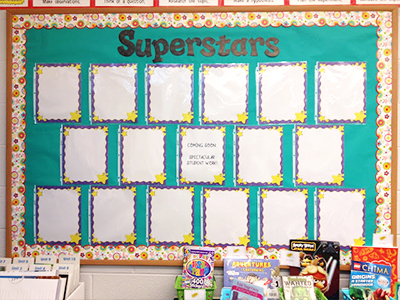 Take the hassle out of assembling writing portfolios by displaying a two-prong manila folder with each student’s name or picture on a bulletin board at the beginning of the year. Use each file folder as storage for all their writing for the year, then send the entire portfolio home for a year’s worth of writing in one neat little book. 21. Get organized for emergencies. Emergency drills are a necessary part of the job, and the more organized you are, the less time-consuming these drills will be (this will also help out big time in case of a true emergency). Keep everything needed for emergencies (fire, tornado, safety) in a red folder hanging by the door. Include pictures of students, class rosters, emergency phone numbers, etc. Simply grab and go when it’s needed. For teachers with multiple classes, miniaturize your class lists and cut them down to slide into your ID badge. In case of emergency drills, you have any student lists necessary—even if you’re in the cafeteria, hallway, or gym. 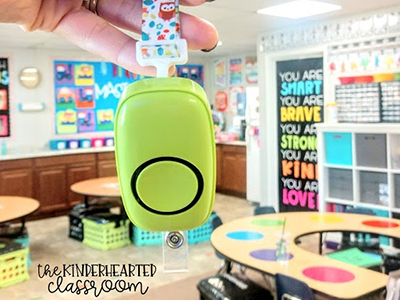 Have students turn on a battery-operated light before they leave the room to go to the restroom. If there’s a fire drill or lockdown, all you need to do is look for the light to know if a child is missing. 22. Make your center materials last. For math and reading centers, print out all of your materials in black and white, have students color the activities with markers, then laminate them. You’ll save money on color prints, and the kids will have a sense of ownership and take better care of the materials, saving you time. Instead of reprinting center materials each year, you’ll only have to do it every two to three years. 23. Simplify parent communication to save time. Do you have a message that you want to send to multiple parents? Rather than spend hours making individual phone calls or emails, send a bulk email by drafting one to yourself (with your address in the “to” field) and blind-copying the parents you want to communicate with. That way, you can reach 20-plus parents at the same time rather than contacting them individually. It’s a great time-saver and it also documents that you’ve reached out. One of the best ways to save time is to get your class running like a well-oiled machine from the start. Being ridiculously specific about rules during the first week of school can save hours of time later on. 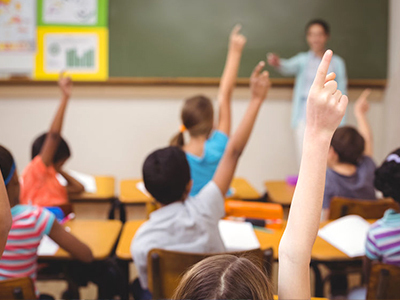 You can even be specific about things like hand-raising by asking that students raise one, two, or three fingers depending on what they need. This will let you know exactly how to respond to each student and get a sense of whose needs to prioritize. We all have unique skills and knowledge, and though no busy teacher wants to waste time on idle chitchat, you’d be surprised at the wealth of tips and tricks that can come straight from your very own colleagues. Make a point to visit, share, and talk with other teachers (even if you have to get out of your comfort zone a little bit!). Closed Facebook groups are also an easy way for teachers to get new ideas and build camaraderie without taking up time during the school day. 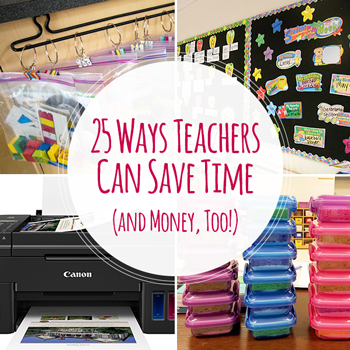 Have a unique classroom hack to help teachers save time and money that you want to share? Comment and let us know! *Page yield of included ink bottles used for initial setup is lower than the replacement ink bottles, as a certain amount of ink is consumed to fill into the print head during setup (charging the print head initially). Page yield is the estimated value based on Canon individual test method using the ISO/IEC 24712 chart and continuous printing simulation with the replacement ink bottles after initial setup. Page yield of color inks is an average yield of cyan, magenta, and yellow inks combined. Page yield varies significantly depending on content printed, ink levels maintained in all four reservoirs, and other factors. Up to 6,000 (black)/7,000 (color) printed page yields are approximate, based off document pages printed.